Formula Meal Plan by Vie! We reached out to our good friend and radically talented Chef Lynsie Steele to see if she'd be interested in doing a guest post with recipes to help our clients get the most out of their workouts, and man did she deliver, to the tune of a meal plan for the entire week! 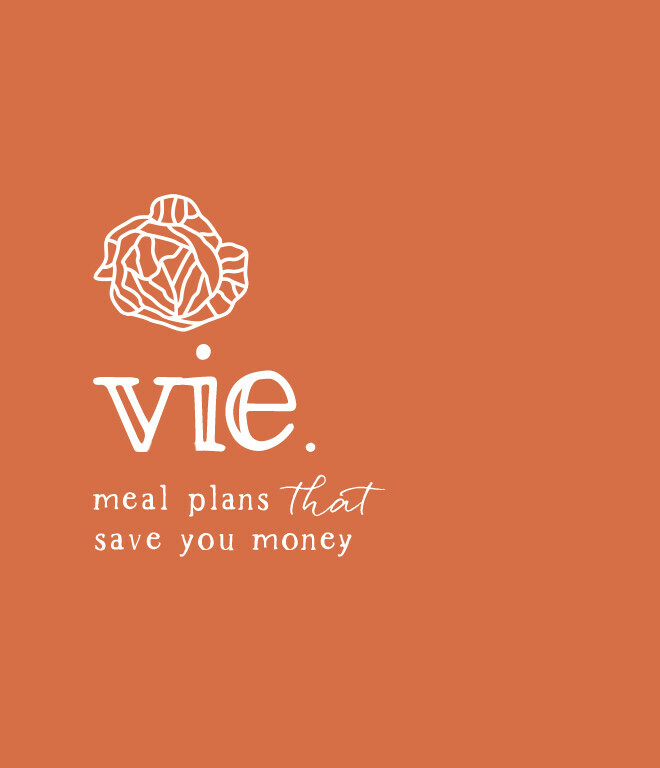 This post was originally published at getvie.com, where Lynsie and her team design meal plans to help you eat well while saving money. Scroll down to check out her meal plan and view some highly informative meal-prep videos! Per Lynsie, this plan is designed for use at Trader Joe's, but can also be used anywhere. Simply make sure to compare prices and choose items that are on sale. I’ve designed this meal plan with athletes in mind. It’s filled with lean protein, lots of vegetables and is easy-to-prepare when you’re busy. Many meals can be made in advance and require as little prep as possible for a healthy diet and lifestyle. Do not hesitate to get in touch with questions! Here is what your Meal Plan entails: 4 Main Dishes & 2 Large Sides that can be dispersed accordingly throughout the week to go along with. We also suggest 1 Soup for use for lunches or as an accompaniment to dinner! I’ve also included 3 videos that pair with 3 bonus recipes. Depending on your family size, this plan will last you between 1-2 weeks. Cook oatmeal with ½-1 banana for a decadent, caramelized twist. Or enjoy waffles or toast with eggs and bacon! My personal favorite thing to do is whip up a big batch of Green (Hydrating) Smoothie and bring it with me to the gym for my post-workout meal. I mix blend 8 oz coconut water with 1 banana, 1/2 cup frozen mango, 1/2 cup frozen pineapple, 1/2 medium cucumber (seeds removed), 2 big handfuls spinach and a peeled and seeded lemon or orange (depending on how I'm feeling). This batch makes two servings, so have one before your workout and one after. Also, have a smoothie bowl all ready for lunch or late-afternoon snack--waiting for you at home: combine 2 cups frozen berries with 1 cup plain yogurt, 1 cup oats, 2 Tbsp nut butter (unsweetened) plus 1/2 cup toasted nuts (cashews are great), ground flax and chia seeds for sprinkling on top. Spread some Dijon mustard on toasted ciabatta and layer with ham and Swiss for a “very Vie” lunch or just enjoy some leftover greens for a light salad + soup. Also, enjoying calcium-rich and protein-filled sardines, smoked trout or oysters over canned lentils + Dijon mustard + crackers is an amazing combination and a great recovery food after a long run. Pre-making lunch throughout the week is a great way to stay on top of your meal planning because if you've put in the effort to make food for yourself (and you know it's waiting at home) you are far less likely to be deterred by your local fast food joint when hunger strikes. This is why Vie works: we are big leftovers-for-lunch promoters! You'll have lots to choose from so each day can be different, PLUS most of what you're eating has already been prepared! If you're making sandwiches in advance, great! Just make sure you nestle your ham in between two slices of Swiss (to keep the bread from getting soggy) and leave off the Dijon until just before serving. Let’s do some yogurt parfaits this week! Layer granola, fresh berries and yogurt in mason jars and enjoy throughout the week. (Or just put together a quick plate of crackers and cheese.) Better yet, check out this video here (or this step-by-step tutorial here) to learn how to perfectly blanch green beans for easy and healthy snacking throughout the week! This recipe is perfect if you don't have a lot of time to cook and you may be feeding someone who doesn't always love their veggies! We use many different kinds of vegetables to make our pasta sauce and they eventually get blended until smooth, which helps to not only "hide" them, but adds an amazing depth of flavor. The best part is that this sauce can be made in the slow cooker overnight or while you're at work! Extra: brown 1 lb ground beef (you can substitute lamb, pork, chicken, turkey, or sausage) with a bit of chopped onion in olive oil and add to your sauce for extra protein! In a large soup pot, sauté onions, garlic, squash, celery and carrots in olive oil for 10 minutes, stirring often. Add fire-roasted tomatoes, water, salt and red pepper flakes and stir to combine. Simmer for 20 minutes. Once cooked, purée using a blender or immersion blender. While sauce is simmering, cook pasta according to package instructions. Taste sauce and adjust seasonings if needed. Serve sauce over pasta. Make sure to add browned ground beef for extra protein if desired. This recipe makes a large batch, which is perfect for use throughout the week. Even better, you can freeze the sauce in an ice cube tray and thaw as needed to flavor sauces, soups and stews. In a blender, add half the parsley and cilantro with the whole garlic, mayo, red pepper flakes and lemon zest + juice. Blend until smooth, adding a splash of water as needed to help it come together. Add the rest of the parsley and cilantro and blend until smooth, adding more water again if needed. Add half the salt and pepper, give it one more blend until everything is incorporated. Preheat oven to 400 F and on a baking dish, arrange zoodles. Pour ½ cup Green Goddess Dressing over top and toss to coat. Add shrimp over the zoodles and drizzle with remaining salt, pepper, minced garlic and the 1 tsp of olive oil. Place in the oven and bake for 15-25 minutes, or until zoodles are bright green and shrimp is opaque. In a large bowl, combine all Meatloaf ingredients with your hands, leaving out half the tomato sauce. Oil a loaf pan or deep baking dish and press meat mixture into the mold. Pour the rest of the tomato sauce on top and place in the oven for 1 hour. *This can be done in a crock pot as well: simply line the crock pot bowl with foil, oil it and press meat mixture in. Cook on low for 6 hours. Place bread on your work surface on a foil-lined baking sheet. Toss tomatoes with garlic, olive oil, salt, pepper, and lemon juice. Stuff slits of ciabatta with half the mozzarella and tomato mixture (bruschetta). Stuff in torn basil, red pepper flakes and the rest of the mozzarella. Bake for 20 minutes or until everything is heated through and melted. Cook yellow onion, garlic and spices in vegetable oil over medium heat for 5 minutes. Add almonds, coconut milk and brown sugar, plus enough broth or water to cover almonds if the coconut milk isn’t enough. Simmer for 20 minutes, then transfer to a blender and purée. Return to the same skillet, add the cauliflower florets and chickpeas and simmer for 15 minutes more, or until the cauliflower is tender, which could be in as little as 10 minutes if covered. While korma is cooking, cook rice on the stovetop or in a rice cooker in 4 cups water until rice is tender. *This can be done ahead of time OR you can scare up some leftover grains from any other meal. Serve over rice with toasted almonds, cilantro and a lime wedge. When ready to cook, make rice according to package instructions (1 cup rice gets cooked in 2 cups water). It doesn’t matter that your rice is perfect once cooked since you’ll be cooking it with a bunch of other delicious things soon! In a large wok or skillet, heat oil over medium-high heat and add chicken (removed from marinade, marinade saved). Cook on each side until done, about 5-6 minutes, and remove to a plate to cool. Add more oil as needed and cook ginger, snap peas, rice and ½-1 cup of the leftover marinade together until snap peas are bright green. Serve with sliced chicken on top. Preheat oven to 250 F and scatter cubed bread on a baking sheet evenly. Toast for 15-20 minutes or until crunchy all the way through and light/airy. Raise oven temperature to 350 F for stuffing. Brown sausage in a large skillet with high sides. This skillet needs to be oven proof. After 5 minutes, add sage, celery, onion, and garlic and continue cooking for 5 minutes more. Add cubed and toasted bread to the sausage mixture, then carefully combine with cubed apples, maple syrup and salt and pepper. Pour in enough broth to reach ¾ the way up the sides of the pan (add more water if you run out of stock) and place in the oven to bake for 30-45 minutes. Preheat the oven to 375 F. In a bowl, toss pecans in sugar, oil, bourbon and salt until evenly coated. Place on a foil-lined baking sheet and toast for 10 minutes. Remove from heat and allow to cool. If they are not candied enough once cool, return them to the oven for 5-10 minutes more. Heat olive oil, garlic and red pepper flakes slowly over low heat for 8-10 minutes or until garlic is lightly browned around the edges and slightly crispy. Add greens, cider vinegar and soy sauce and cover as best you can. Set a timer for 5 minutes. Once timer goes off, lift lid, toss greens with tongs and taste. Keep cooking if the greens need it, although they should be bright green. Serve in a bowl topped with crunchy pecans in single servings, making sure to reserve pecans for later in the week since adding all of the pecans now will make them get soggy if stored in the fridge. In a large soup pot set over medium heat, cook onions and garlic in olive oil for 5 minutes. Add flour and cook for an additional 3 minutes, whisking often to prevent burning. Add broth into the middle of the pot, a little at a time, while whisking onion and flour mixture to create a thick sauce (a roux--see our video tutorial on our blog for tips). Once 1 quart of broth has been introduced, add half the butternut squash and bring to a boil, then reduce to a simmer for 10 minutes or until squash is cooked through. Pour into a blender and purée until smooth, return to the sop pot and add the rest of the squash plus corn and cubed potatoes. Add salt and pepper at this point and cook until squash and potatoes are tender, about 10-15 minutes more. Taste, adjust seasonings as needed and serve with crumbled cotija on top.